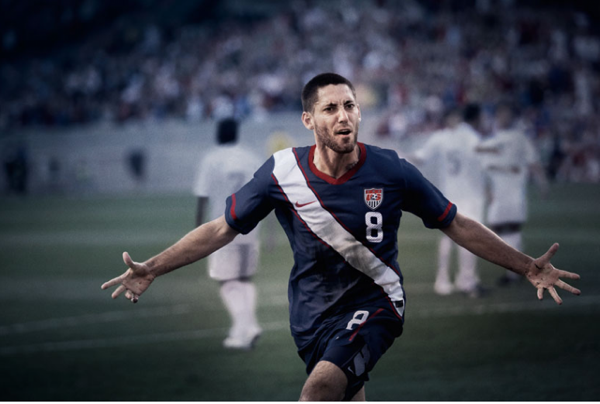 Images of the USA’s new Nike away kit have hit the internet with the force of an Alan Shearer elbow. As we reported last year, the USA kit template does indeed have a ‘beauty queen’ sash down the front, both on the off-white home kit and navy-blue away k. Superfluity ahoy! Apart from the unnecessary sash, I think Nike have done a decent job. I like the socks, for example, but that sash is a bigger eyesore than Martin Keown’s face. Scroll down for some more pics of USA stars showing off the new kit, plus a couple of shots of the new warm-up kit (much smarter than the playing uniform). Maybe I’ve watched Little Miss Sunshine one too many times, or have a 12 year old beauty queen trapped in my 40 year old male body, but…but….the sash is cool. Without the sash it’d be plain. If England can have their 1966 throwback kits, then why can’t the USA kits be an homage to their 1950 England-beating squad? Agreed. The sash has history as part of a U.S. kit. Love the kit, still hate the crest. Oof, I know they’re suppose to look tough but all of them look like total douchebags which sadly they are. I think it rocks. Too bad the Dutch had to knock out Stuart Holden after he just started breaking into the lineup for Bolton. At least Beasley looked good as he has lately for Rangers.